Over the last 17 years of running Flax I’ve met many people who loudly profess to be experts in various aspects of the search business. Some have a new product or service to sell, that promises to change the game forever; quite often this turns out to be snake oil or simply a new name for an old solution. Others seem to have arrived suddenly, fully-fledged, enthusiastic to convince us old hands that everything will be different now if we all sign up to their new idea. There’s also a small group of people who tend to be quieter about their expertise, perhaps because as independent practitioners or small business owners they’re not supported by the marketing budgets of large companies. These people survive on their reputation, which has been built steadily on a record of solid advice, honesty and neutrality. I’m now lucky enough to be part of this group – an informal network of experts in subjects as diverse as search for Sharepoint, intranet strategy and taxonomy management. Occasionally we collaborate on projects, often we recommend each other to our clients and it’s always hugely enjoyable to meet in person and discuss the latest trends and industry landscape. This informal network means Flax can offer more services to our clients – and if we can’t help, we probably know someone we trust who can. 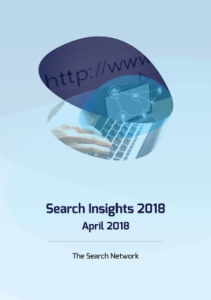 So I’m very proud to announce that this group – the Search Network – are releasing a joint publication, Search Insights 2018. In this 70-page collection of essays you can learn how to research, procure, choose, budget, plan and run a search project in the best way for your business and your users. Unlike some other industry reports, we’re not charging for this report, you won’t have to register or give us your email address, and it’s Creative Commons licensed so you can even redistribute it if you like (with attribution). There’s no sponsorship, no plotting of vendors on confusing trend diagrams, no marketing buzzwords or direct recommendations – after all, we’re independent. We welcome any feedback you have of course. My personal thanks to Martin White who has led this effort and who has also written about the Network and the report.